Bear Mattress, a new company to the online mattress game that promises a cool comfortable night of sleep sent me over their Bear Pillow to check out. The question is, what makes the Bear Pillow any different from a pillow you could pick up at any department store? I received the Queen bed pillow, and although I sleep on a King bed, the Queen seems to do the job for me. With dimensions of 28″ x 18″ x 2″, the Bear Pillow is suitable for the standard pillow case. The pillow itself is hypoallergenic, which especially for someone like me who’s allergic to virtually every element is a huge thing. Typically you would have to pay separately for a hypoallergenic sleep cover, but Bear Mattress actually has you covered in this regard. The packaging of the Bear Pillow was pretty straightforward, highlighting the company’s name and details of the pillow in a clear wrapping that lets the pillow be the main focal point, which is something I appreciated. Coming from using one of those Black Friday Cooling Pillows from Costco that last about two months before going flat and needing to buy another, the Bear Pillow is a dream to sleep on. The Pillow is all white with blue accented mesh panels on each side that allow continuous air flow when you sleep. 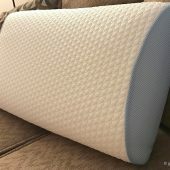 If you tend to get hot and sweat in your sleep, this could be a HUGE deal for you, and after using the pillow for the past few weeks, I’ve noticed that I don’t get as hot in the middle of the night, but when rotating in my sleep the pillow contours to my movements thanks to the patent-pending LOFT-X Foam technology, which makes sure that your head and spine are aligned so you don’t wake up with those god awful pains in your neck. The packaging of the Bear Pillow was pretty straightforward, highlighting the company’s name and details of the pillow in a clear wrapping that lets the pillow be the main focal point, which is something I appreciated. Coming from using one of those Black Friday Cooling Pillows from Costco that last about two months before going flat and needing to buy another, the Bear Pillow is a dream to sleep on. The Pillow is all white with blue accented mesh panels on each side that allow continuous air flow when you sleep. If you tend to get hot and sweat in your sleep, this could be a HUGE deal for you, and after using the pillow for the past few weeks, I’ve noticed that I don’t get as hot in the middle of the night, but when rotating in my sleep the pillow contours to my movements thanks to the patent-pending LOFT-X Foam technology, which makes sure that your head and spine are aligned so you don’t wake up with those god awful pains in your neck. As an Arizona Cardinals fan, I found it interesting that Justin Bethel, a corner for the team not only is a fan of the pillow but speaks highly of it. Admittedly I’ve drooled once or twice on the pillow and a main concern with pillows like these that have a “coolant system” inside of them is actually washing them so they don’t permanently stain. Bear Mattress thought ahead and just like their very own mattress cover, the outer shell of the Bear Pillow is washable. You basically take it off, throw it in the wash on a medium cold cycle and that seems to do the trick. Bear also says that you can spot clean it with a damp cloth and mild detergent, but I’ve yet to try. Overall I really enjoy my nights of sleep now thanks to the Bear Pillow, and can only imagine what the Bear Mattress would feel like. The Pillow will set you back $95, but with a two-year warranty and free shipping, not only do you get an awesome looking pillow, but you will eliminate those night sweats as soon as this pillow hits your bed. For more information on the Bear Pillow, you can head over to Bear’s site today.